Providence Flea is a self-described upscale flea market that has all kinds of trinkets, baubles, and other wonders of Providence, RI. It started in June 2013 and takes place every Sunday during the summer until August 25th (rain or shine). I’m not sure how the organizers landed the great location right on the water, but they did. It’s easy to get to and beautiful to look at. My personal interest in Providence Flea has less to do with the flea market side of things and a lot more to do with the local food trucks that line the street catering to customers of all tastes. I’ve had the opportunity to stop by a few Sundays this summer and try some of the food. I won’t be covering all of the food trucks that attend Providence flea in this post, so be sure you know that there are more out there! All of the trucks below serve up quality food though, so you should try all of them if you get the chance. First up, is Lotus Pepper. 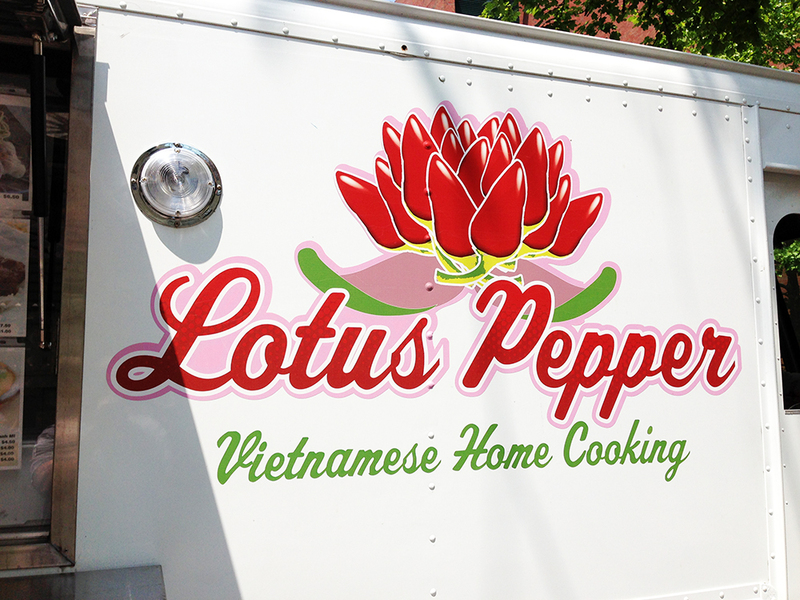 The trucks in this post are in no particular order, but I just wanted to get Lotus Pepper out of the way because I reviewed this truck in a lot more detail in another post that you can read here. They serve up authentic, fresh Vietnamese food daily and often have specials on the menu. Definitely check them out if you haven’t already. 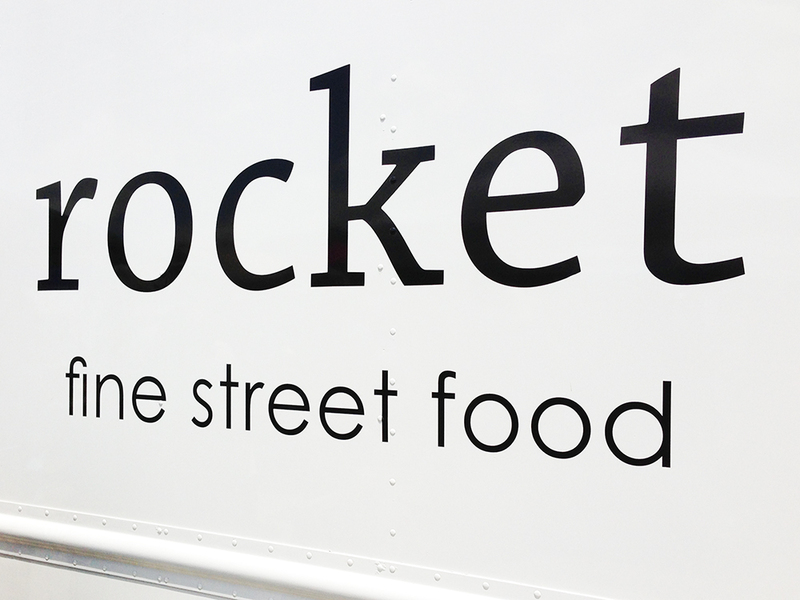 The Rocket truck is currently one of my favorite food trucks in Providence. I haven’t had a lot of different items from their menu yet, but what I have had was delicious. I’ll get to that in a bit. What really makes the Rocket truck stand out are the people that work the truck. They are friendly, happy to see you, and willing to go that extra mile to make their customers happy. I’m one of those people that if you’re nice and give great customer service, I’ll eat at that restaurant over a better one where the staff are jerks. Lucky for Rocket truck, they aren’t sacrificing flavor for service. My friend, AmasianV, first told me about the Rocket truck after he raved about the boar sausage slider (one of their “alternative” menu items) . Just the name alone sold me on trying it, so the next time I went to Providence Flea, I made a beeline for the Rocket truck. 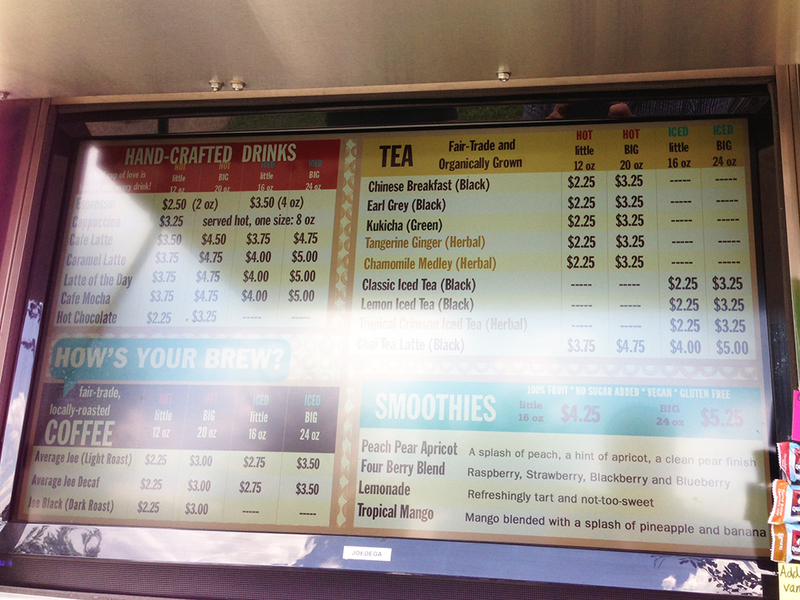 Upon arrival, a very pleasant woman greeted me in the window and asked to take my order. I promptly asked for a boar slider and, with apologies, I was turned down because they had just run out! I was crushed and I think it showed when I announced, “Oh no! That’s what I specifically came for!” Before I knew it, she popped her head back inside the truck, exchanged some words with the chef and told me that if I really wanted boar she could serve me an off-menu item they were working on for fifty cents more. With a grin, I accepted and within a few minutes I had in my hands a boar confit slider! The first thing I noticed was that the slider was small for a burger, but large for a slider. A strange size for a slider, but I’m not one to complain for heartier versions of things. 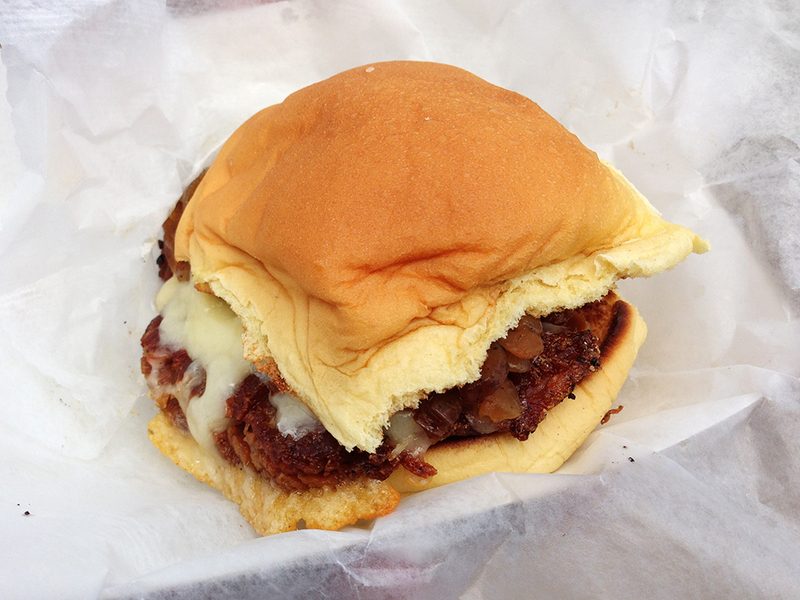 The toasted bun held the boar confit topped with oozing Gruyere cheese and caramelized onions. If you’re not drooling already, I don’t know what’s wrong with you. The real star was the boar confit though. It had an essence of bacon, which makes sense when pork/boar crisps up in its own fat. The outside of the confit was crispy, but the inside was tender almost like a firm pulled pork. All in all, a truly delicious sandwich that I was very pleased to have in place of the sold out boar sausage. The only issue I would point out with the Rocket truck is that (like many quality trucks), it’s a bit pricey. I don’t mean that the quality isn’t worth the price, but rather the quantity. I paid $6.50 for a single slider (i.e. no sides and no drink). Yes, it was larger than a typical slider, but generally, one would expect to at least be able to get more than one slider for less than $12 – $13. Nonetheless, it’s delicious food with good customer service, so I’m happy to begrudgingly pay a bit more to support a local business. I ordered an iced coffee from Joedega and it took longer to receive that coffee than the food from any food truck at Providence Flea. Many of us (myself included) have this idea that a food truck serves food as quickly as it zips around the city. However, that is usually not the case. Many food trucks (especially in recent years) are full kitchens serving high quality food that takes time to make. They just happen to be on wheels. I know that this issue really bothered me when I first started trying more food trucks. I just kept thinking, “What is taking so long?” After tasting some of the food, I understood that sometimes it takes so long, because the truck is actually making something good, fresh, and to order. Nonetheless, there is a balance where sometimes a wait is just too long. Joedega, on this particular day, didn’t strike that balance. Most coffee shops have iced coffee on standby instead of fresh-brewing every cup. I have no idea if Joedega brews every cup of iced coffee to order or if they just have a cold pitcher on hand. In either case, the wait for a simple cup of coffee seemed far too long. I’ve had iced Americanos brewed to order and those took a fraction of the time. In any event, I can deal with a long wait if the product is worth waiting for. Unfortunately, I can’t say that was the case because the iced coffee wasn’t anything special. In fact, I’m begging someone from the Providence area to point me to a place other than Ellie’s Bakery and the Coffee Exchange that makes a good iced coffee because I’m not having much luck. 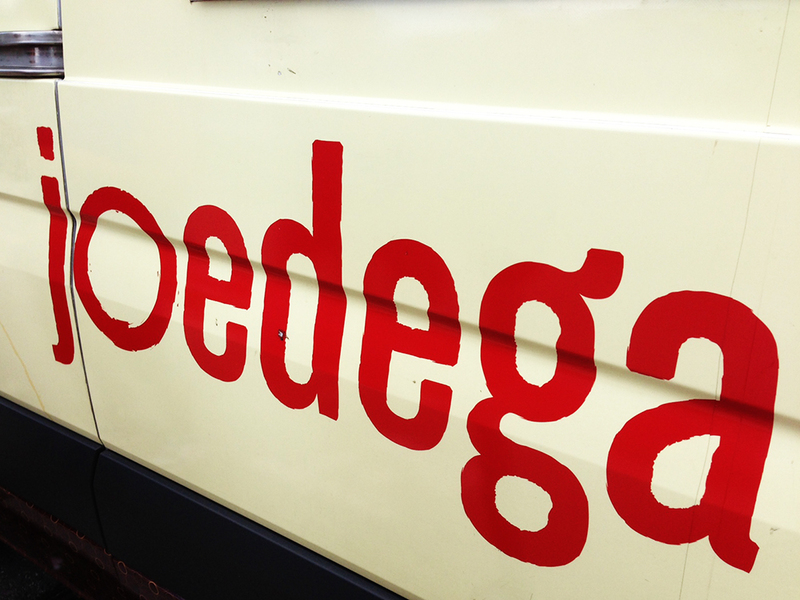 Overall, I dig Joedega’s concept, their menu, and that they’re local. I’ll probably give the truck another shot at some point, but my first experience wasn’t ideal. 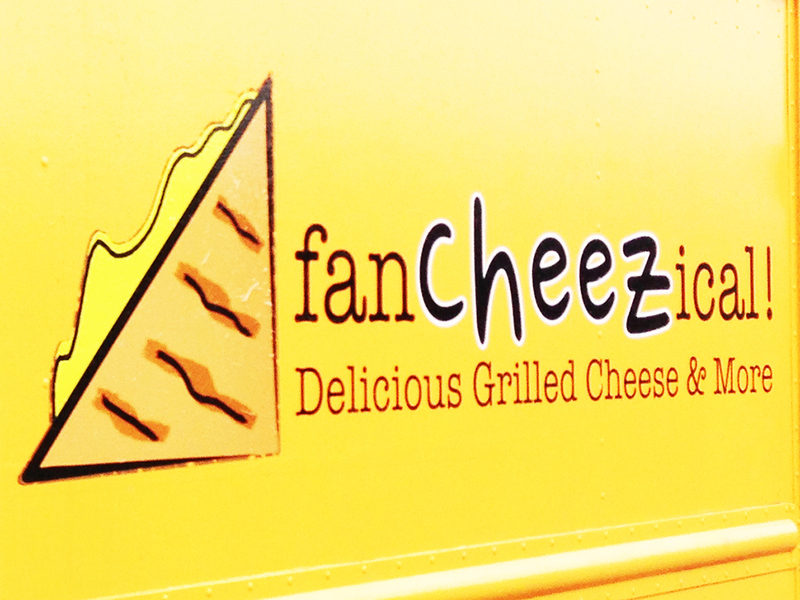 Another food truck that I now thoroughly enjoy is FanCheezical. Like I am with all grilled cheese vendors, I was skeptical. Normally, I don’t buy grilled cheese when I’m out. It’s one of those foods that I know I can not only make at home, but I can make it well. Often, grilled cheese vendors just use some nice cheese and a better quality bread to make their sandwiches seem worthwhile. It’s not usually worth it in my book unless the chefs are really upping the game with the contents of the sandwich. FanCheezical does that. 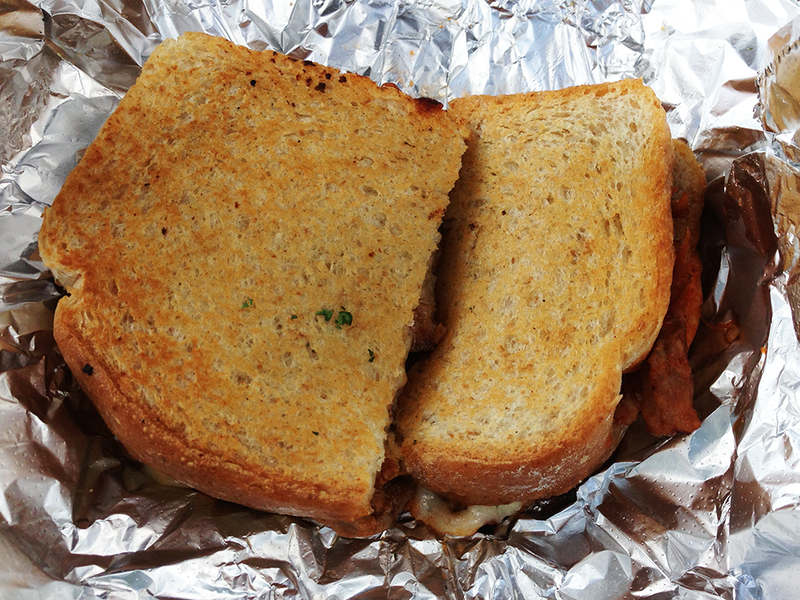 Again, on another recommendation, I tried the pulled pork grilled cheese sandwich. Having not had any food yet from FanCheezical, I started getting concerned when it seemed to be taking a while to get my sandwich. Luckily, I didn’t wait in vain for the hearty, toasty, melted, barbecue deliciousness of their pulled pork grilled cheese. The sandwich is served on rye bread, which works perfectly to cut the the rich cheese and absorb some of the barbecue flavors of the pork. Every bite was not only worth it, but after eating just half the sandwich, I felt full and satisfied. This is a wonderfully comforting and hearty sandwich. I also tried their watermelon salad. 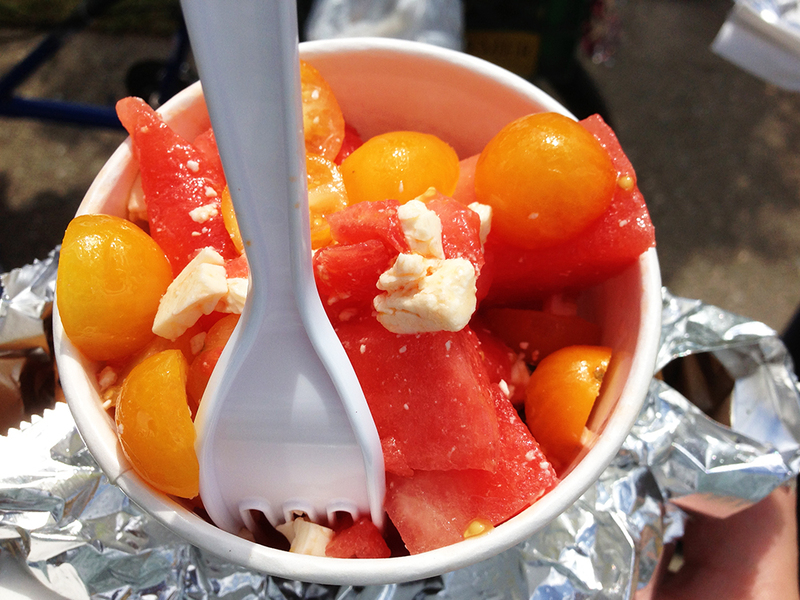 I’d never had watermelon salad before and I was surprised by how well the feta cheese went with the watermelon and cherry tomatoes. The flavors aren’t immediately something I would put together in my mind, but I broadened my palate! On a hot summer day this refreshing dish was a welcome addition to the meal. 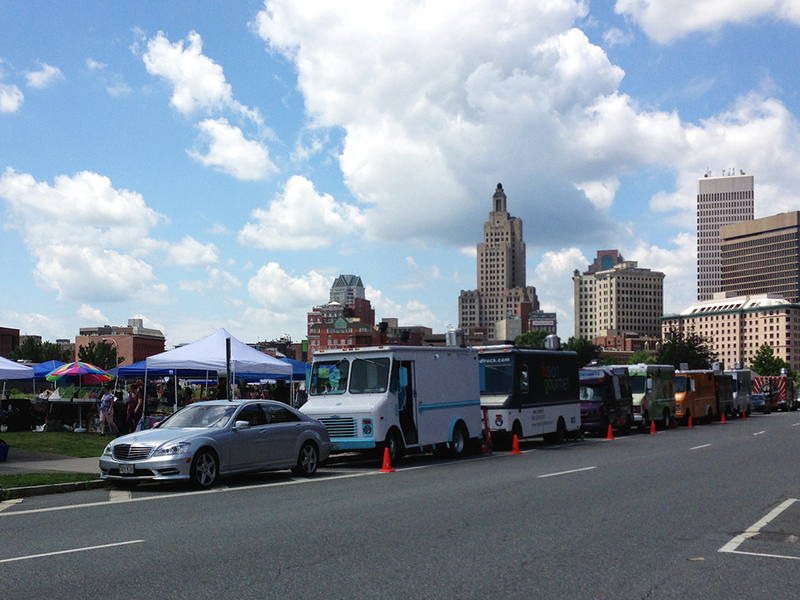 Providence Flea is a lot of fun, easy to get to, and it supports local businesses. Stop by, check out the scenery, and eat some great food. Chat up some of the food truck employees and make sure to ask about specials! Tell them Man Fuel sent you (that probably will have no effect at all, but I thought it would be funny to see the confused looks on employees’ faces)!